Ceramic and porcelain tiles are an absolutely beautiful addition within the kitchen. They provide a durable and long-lasting surface that looks great as countertops, floors, or backsplashes. When installing tile in the kitchen, it can be difficult to choose between the two as so many people use the term “ceramic tile” as a generic ways to refer to all types of tile. Let’s take a look at the difference between the two and what makes each a great choice. Porcelain tile is composed of different clays and minerals, as well as feldspar. Feldspar is a unique mineral that helps improve the strength and durability of porcelain tile when it’s heated in the kiln. Additionally, in order to be classified as porcelain tile, the water absorption rate must be no greater than .5%, meaning that if you put a drop of water on the tile only .5% of the water will be absorbed into the porcelain tile. The lower water absorption rate of porcelain makes these tiles more stain resistant than others and allows for some porcelain tile products suitable for exterior use. Porcelain tile products are also available in glazed and unglazed options. Typically, glazed porcelain tiles are used for decorative purposes while unglazed porcelain tile – one of the most durable tile options available – is great for areas with heavy foot traffic. True ceramic tile, on the other hand, is a specific tile product made of a mixture of red, white, and/or brown clays combined with an assortment of minerals. Ceramic tile is usually porous and therefore is often glazed with a coating of a glass-like material that protects the tile from stains and scratches while also creating a decorative look. Glazed ceramic floor tiles are very durable and can be used in nearly any area of the home. 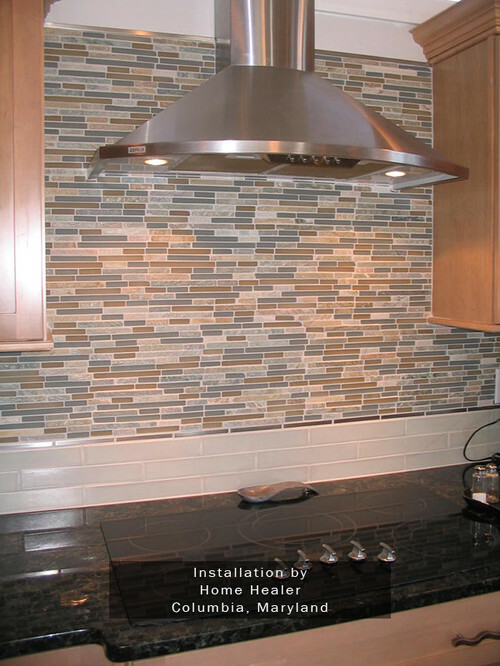 We invite you to contact us at Conestoga Tile with your questions about installing tile in the kitchen. We’ll be happy to provide the information you need to determine which tile squares perfectly with your home.